We showed you some pics of ItalDesign's sort-of neo-Stratos-like supercar-in-hiking-boots yesterday, though at the time we referred to it as the X-GT. 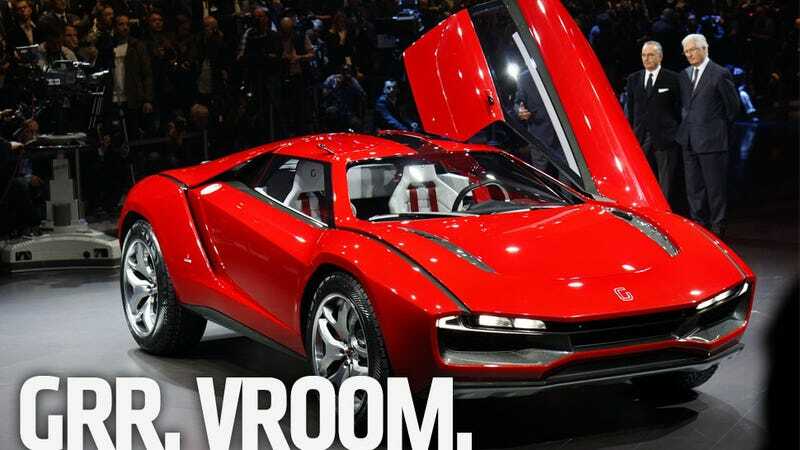 It now appears the official name is the Giugiaro Parcour. It's as wonderful as it is insane. Guigiaro's PR people explain that it's named after the French sport of bouncing around a city like a superball in a library because Parcour enthusiasts "...adapt their body to the surrounding environment..." Which is similar to the concept behind this car, a V10, mid-engined supercar that can dynamically adjust its ride height to adapt to its environment. The big advantage with this, of course, is that supercar owners will no longer need to have valets carefully lift the front spoiler of their cars over speed bumps. The press release also goes on to mention inspirations for the car in action movies, video games, and, of course "the Internet" because I think all press releases have to mention the Internet because of some UN resolution back in 2002 or something. The inspiration for the suspension geometry comes from the so called push rod archetype, which is used on street supercars, GT and Formula racers. On such suspension a rod, connected to awhishbone, pushes the spring through a rocker. The turning point of our concept is that the rod has been substituted by a coilover. This suspension could be defined as a "pushrod 2.0"! It has 8 coilovers installed onboard, 2 per corner.When driving on track or on street, only 4 coilovers are actually working so the car behaves as a standard double whishbone GT vehicle. By means of a complex hydraulic system the ride height can be changed and the rocker may be unlocked so that in offroad conditions all of the 8 shocks start working together, drastically reducing the suspension stiffness. This enables the Parcour to absorb heavy bumps and road roughness. All said, it's certainly not a bad variation on the usual supercar, though I'd hesitate to call it new or revolutionary, as it's certainly been done before. Aside from rally-going Stratoses, there's Local Motors offerings and even VW's Dakar cars could be seen as inspirations. Still, this may be the most sleek and refined version of the concept, and it'll be interesting to see if anything like this finds its way into at least sort-of-mass production.